I am a portrait artist who collects teapots (mainly for their shape and colour rather than value), but I’ve recently begun painting 'portraits' of interesting cups, jugs and of course teapots - anything that catches my eye! They are becoming quite a popular sideline for me, so I’ve become a bit of a magpie, always on the lookout for subjects, and friends will now regularly offer up their china or suggest examples to be immortalised. So I was at my mother in law's house in England not long ago and spotted a lovely cream jug and demitasse cup and saucer in her cabinet, just right for capturing on canvas. I asked her if I could borrow them or photograph them to paint, and she very kindly gifted them to me. She couldn’t tell me much about them other than she had paid under £10 for them at auction. 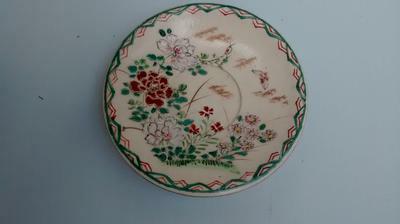 They are unmarked on the bottom, with a dark cream coloured (rather uneven) glaze and have clearly been hand painted in quite a free, almost random, style which looks Chinese (Choinoiserie? ), with a variety of flowers, birds and insects which are quite randomly placed, as well as some sponging in a gold/bronze colour. 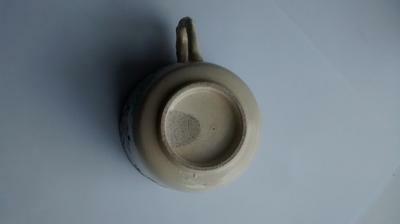 The glaze is missing from a patch on the bottom of the cup: from its shape it looks to have been caused by a finger when dipped, and this reveals the clay. There are circular throwing marks on the bottom and my potter friend identified the clay as stoneware. 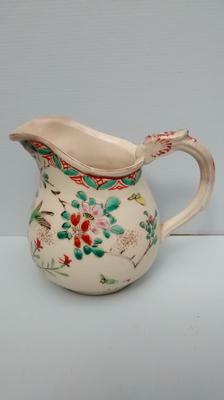 The handles have been fashioned as dragons with some red oxide coloured decoration which has largely worn off now. see anything similar, though if I’m missing something please let me know. Searching for similar images online was time consuming and not very useful, however eventually I was delighted to track down another similar demitasse cup and two saucers for sale on ebay. I contacted the seller who again knew nothing about them except that they were probably Staffordshire earthenware, which is what he had listed them as. He had no idea of the age. I decided to buy this other cup and saucers (for about £5) and they arrived this morning – they are slightly smaller than my original but clearly made in the same way, although the glaze is rather glassier, more beige in colour and more crackled. 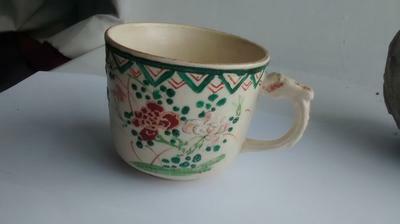 The ebay cup has a staple repair to it which looks pretty old (and adds to its charm, in my opinion!). Again the enamel glazes are quite randomly painted and I was charmed to see that my ‘new’ cup and saucers also included bees as part of their decoration. Someone was really on a flight of fancy when painting these! I’d be really grateful if anyone had any more information on the kind of date for these. My gut feeling is 18th century, but I could be completely wrong. I’m less interested in value than their provenance and age – are my hunches correct? Do they predate English bone china, I wonder? Or are they an example of ‘chinoiserie’ made from less expensive clay for the aspirational market who couldn’t afford the real deal? Or are they more recent? An internet image search has failed to find anything similar so far (apart from the ebay ad). Are their lack of markings a sign of being very old, or something else? Whatever they are, I really like them and they’ll make a great subject for a painting!